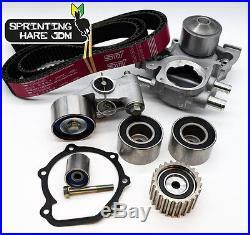 This timing belt kit will fit all Turbo Impreza's 1998 on-wards (with the automatic tensioner fitted). This will only fit cars with a 3 port waterpump fitted manual cars only (will NOT fit JDM cars with external oil cooler fitted). This is a FULL kit including ALL idlers, STI uprated belt, tensioner and waterpump. This kit contains the newer "uprated" double bearing small idler and bolt. 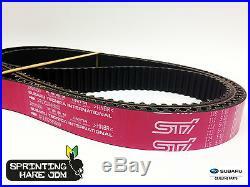 The uprated STI timing belt in this kit is manufactured by the world renowned STI department of Subaru. The belt is reinforced and can sustain much higher power figures than a standard belt, and will refrain from stretching and jumping and will withstand higher temperatures than a standard belt. NOTE: There may be an increase in noise from the motion of the timing belt, this is due to the reinforced material of the STI belt and is normal. ALL components in this kit are Original Equipment aftermarket parts, and bearings are ALL KOYO NTN and NSK - Japanese parts of the highest quality. The exact same items as Genuine Subaru without the price tag. 1 x STI Uprated Timing belt - with timing belt marks for easy installation. 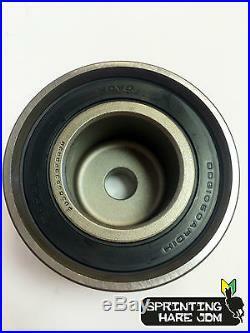 2 x KOYO plain bearing idler's. 1 x NSK toothed idler. 1 x NTN "uprated" double bearing small idler. 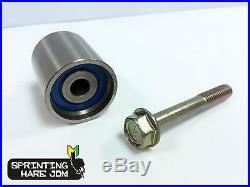 1 x Genuine Subaru longer bolt for small idler. 1 x NTN automatic tensioner. 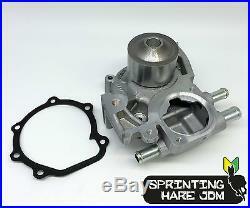 1 x AISIN 3 port waterpump with gasket. 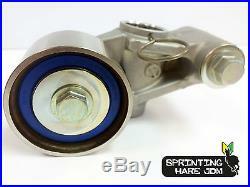 Sprinting Hare JDM are a specialist company in supplying Subaru parts, predominantly for the world famous Impreza. We import Genuine Subaru and STI Factory parts direct from Japan, we also import rare JDM new and used Subaru parts which are only available in Japan. We carry a large selection of Genuine Subaru and high quality aftermarket parts on the shelf. All aftermarket parts are either from OE manufactures or to OE standards. We are an Exedy distributor and are able to supply the full and extensive Exedy product range for both standard and racing series. We also stock and are able to supply many performance parts from leading manufacturers such as: ACL, King Racing, ARP, Seibon, Exedy, NGK, SuperPro, Powerflex, Project Mu, Gates Racing, BC Racing, K-Sport, Tomei, HKS, Mahle, Manley, AST, Cosworth... For any inquiries, no matter how big or small please don't hesitate to get into contact. The item "Subaru Impreza 1998-2015 STI Pink Uprated Cam Belt Kit Inc Water Pump (P1 WRX)" is in sale since Monday, September 26, 2016. 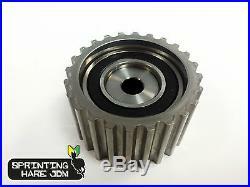 This item is in the category "Vehicle Parts & Accessories\Car Parts\Engines & Engine Parts\Other Engines & Engine Parts". The seller is "sprinting-hare-jdm" and is located in Patchway.